2014 was a good food year for me. 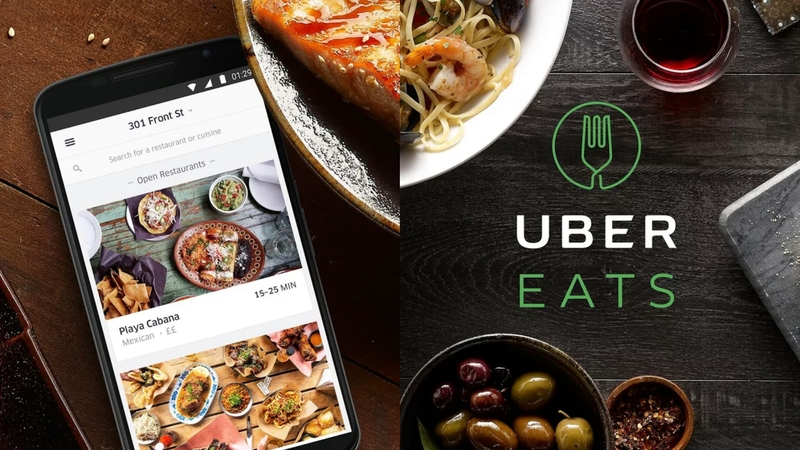 Trips to Chicago, Paris, and London helped to highlight how good food transcends any one region. 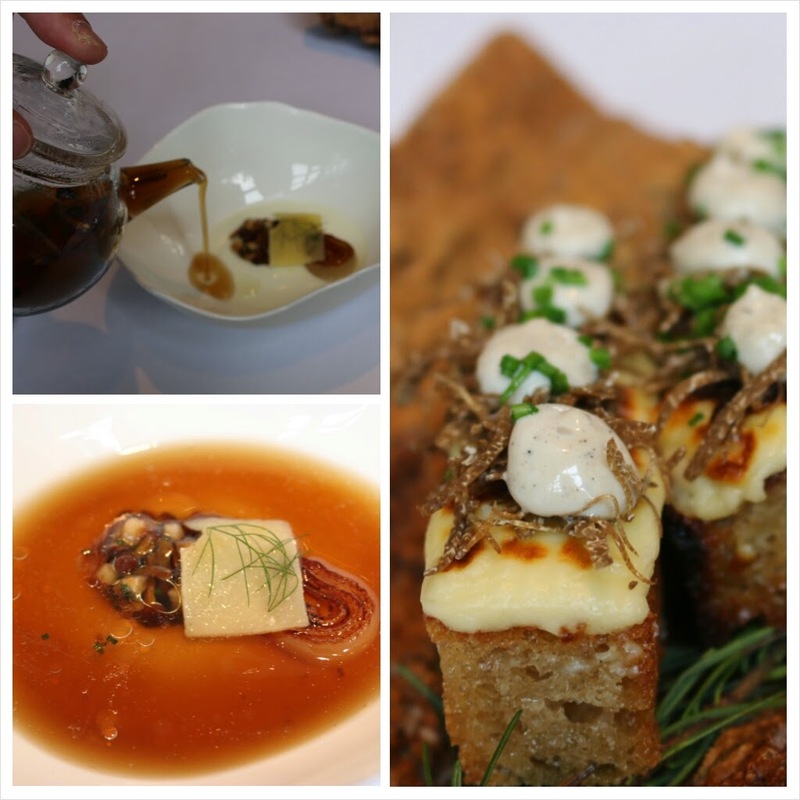 In no particular order, from street eats to fine dining - here are my favorite bites from 2014. Feel free to check the links for more descriptions and pics! Happy New Year everyone - and here's to an even better 2015! Technically I had this at the 2013 Chinatown Night Market, but had my first Mac Mart Truck experience in 2014. There are delectable offerings across the board, but the true star is the heart attack mac. Can't go wrong with caramelized onions, bacon, and Parmesan panko! It's hard to pick from some of my all-time favorites at Vetri - the spinach gnocchi with brown butter is definitely a winner. 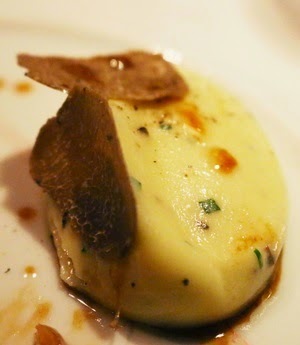 But the sweet onion crepe we had this year but so rich and savory, complemented nicely by the truffle fondue. Spinach Gnocchi with Brown Butter is always great but the sweet onion crepe was even better than the last time for me. There are a variety of dishes on offer at Han Dynasty - I have yet to disappointed with any. But new revelation for 2014 was the dry pot chicken. Crispy, juicy, and spicy - do try this! We all know that Dim Sum Garden is known for their soup dumpling aka XLB, which are amazing. But these beef potato pancakes are latkes are steroids - gluttonous, yet crispy, and satisfying, I could eat a half dozen of these easy. No surprise that Top Chef winner Nicholas Elmi is making a foray onto my 2014 list. The salty, crispy pancetta provided a nice textural contrast to the creamy, pillowy ricotta gnocchi. An additional layer of flavor was provided by the sourdough bread crumbs. A must order! All the small plates and dishes at Amis are amazing. But after ordering a gauntlet of dishes, I didn't think to order this lasagna. The kitchen put me on notice appropriately by sending out this complimentary dish. It was like eating a large crispy cheese raviolo infused with delicate spinach flavors. Definitely a must order. Enjoying one of the food truck events at the Oval this past summer, I was finally able to try the Tot Truck. This mini food truck was able to crank out perfectly fried and crispy tots, loaded with some great beer cheese sauce. Crispy bits of bacon imparted savory saltiness, with the sour cream providing a cool, creamy element to each bite. It's no wonder that Chef Alain Passard consistently maintains 3 stars at his L'Arpege. The majority of the dishes focused on vegetables, with a particular emphasis on the "simple" tomato. 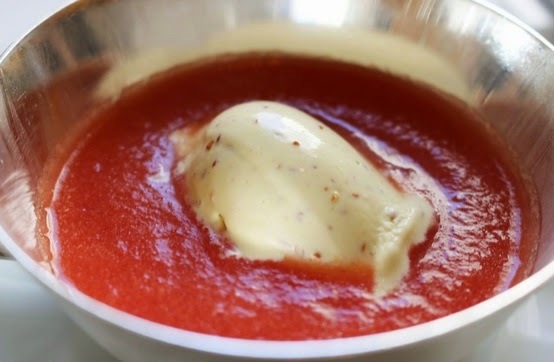 This tomato gazpacho is oft-lauded - the cool acidity of the tomato tempered nicely by the chilled sorbet of whole grain mustard. Complex, despite the fact that there can't be more than a few ingredients used here. Incredible. We had the grand tasting at the 2 star St. Germain location and with our final entrees, we were served the famed mashed potatoes (1:1 butter to starch ratio!). These came topped with black truffles, and were decadent and velvety. We enjoyed them so much the kitchen sent out a whole pot of the mashed potatoes for seconds! You don't need to spend all your euros at Michelin-starred restaurants in Paris. 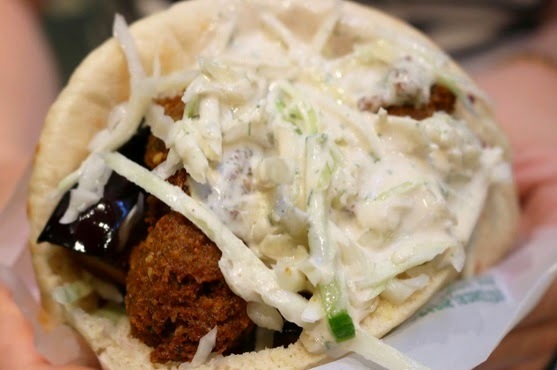 Do check out L'As du Fallafel, which many proclaim to be the best falafel in the world. Amidst the crispy falafel, this sandwich was creamy with the eggplant and tahini, with a nice crunch provided by the slaw and cucumbers. In London, we had to stop by Borough Market and were not disappointed. 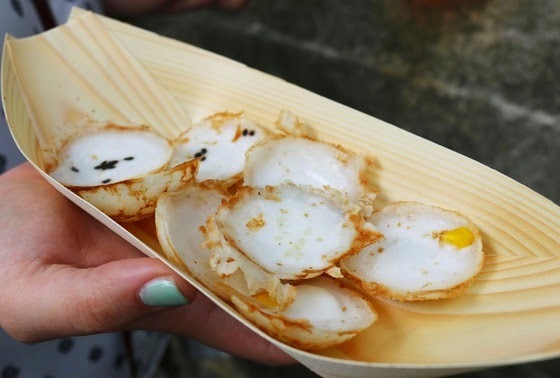 Despite trying scotch eggs and pies with mushy peas, the best bite easily went to Khanom Krok's coconut pancakes. Griddled to order, these coconut nuggets were crisp underneath with creamy pools of coconut milk studded with black sesame, white sesame, or corn. I'd fly across the pond just to have these again. 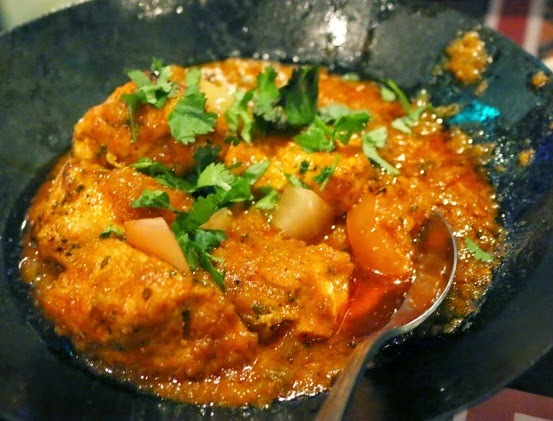 Anyone in the know about food understands that chicken tikka masala is London's dish and that curry country is centered around Whitechapel. The lamb chops here were great, but the chicken tikka was one of the best I've ever had - moist, huge pieces of boneless chicken were amidst a plentiful bounty of onions and potatoes. But really, it's all about the spice mix which definitely elevated your senses. Located in Notting Hill, the Ledbury was a joy - the food was great, the service was even better. One of our favorite dishes was a bonus course from the Chef - a Hampshire bufffalo milk curd with a broth of wild mushrooms and Parmesan. This was accompanied by black truffle toast, which was buttery, moist, heady, and crisp. Wow. Short ribs are pretty standard. But when it's done perfectly, you can't help but smile. Izakaya is located in a casino. While it is the Borgata - again, it's in a casino. That didn't stop Chef Michael Schulson's staff from executing an incredibly tender and well-braised dish. The kabocha helped to offset the savory depth of the sauce and the richness of the beef. There's nothing but praise for IndeBlue, which came onto the Midtown Village scene in 2013. I don't know what took me so long to check it out. While the butter chicken was amazing, this complimentary dish of spinach chaat was exemplary. The spinach was coated in a light chickpea batter, which rendered the greens incredibly crispy. The bite of the onion and shallots, tempered by the sweet yogurt and tamarind sauce helped to brighten each bite. This complimentary dish from the Dandelion shows that sometimes it's better to let the kitchen decide what you should eat. The creamy, succulent crab risotto showcased fresh crab stock, with grains were just al dente. The surprising star here was not the jumbo lump crab, but the Fresno chilies, which provided a nice kick to your tongue. And why don't we end 2014 with a palate cleanser, from one of my best experiences of the year. Dinner at Alinea is an introduction into what food has become in the past decade - modernist cuisine and the like. However, this can only be pulled off well by a few chefs and Grant Achatz is definitely one of them. Sure the black truffle explosion and the hot potato were amazing, but this watermelon dish blew my mind. Injecting a cube of watermelon with the flavors of strawberry? The accents of sudachi and avocado dust? Blew my mind. And with that, I hope you all enjoyed what Belly of the Pig had to offer in 2014 and look forward to providing much more in 2015. Feel free to follow me on Instagram to get some instant foodporn gratification. Thanks to everyone for your support!